Print anywhere with Epson's smallest and lightest wireless A4 inkjet printer that can be charged on the go via USB. This is the portable printer you've been waiting for. Epson's first-ever A4 portable printer is great for professionals who need to print invoices, contracts and more while working remotely. and compatibility with Apple AirPrint1, Google Cloud Print and Epson iPrint. 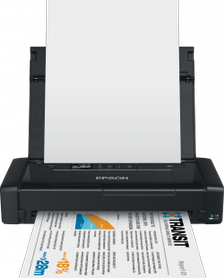 Epson's smallest and lightest wireless A4 inkjet printer, the WF-100W has a built-in battery that can be recharged anywhere via USB. It's small and compact, measuring just 309x154x61mm and weighing 1.6kg. Its wireless connectivity means the WF-100W cuts out all cables, allowing it to be used hassle-free both in clients' homes or in a vehicle. The quality of this printer is reflected in the quality of the printouts. In fact, it is the only portable printer that uses pigment inks for all colours for durable, smudge-free results. Compatible with Apple AirPrint1 and Google Cloud Print for wireless printing, the WF-100W also benefits from Epson Connect. 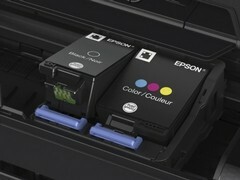 As well as the Epson iPrint2 app for wireless printing from most tablets or smartphones, Epson Connect also includes Email Print, which means you can print from anywhere in the world. The WF-100W delivers an ISO print speed of 7ppm in black and 4ppm in colour3 and has an ink yield of up to 250 pages in black and 200 in colour4. With a 3.7cm LCD screen, it's always easy to set-up a Wi-Fi connection without the need for a PC, and to check ink supply levels.